For this week's TWD our lovely hostess Tara of Smells Like Home chose a recipe that I wish I could've participated in, which was the Traditional Madeleine's...however I don't yet have a Madeleine pan :( So I was able to choose a past TWD recipe and bake that instead. And I have to say I believe I picked a winner. I have been wanting to make Snickery Squares forever now, so I decided this was the best time to do it. 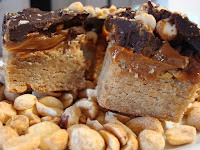 For my squares I wanted to make a different base than shortbread, so I decided to make a peanut butter cookie base...which OMG was so yummy! How can you go wrong with PB, dulce de leche and chocolate? Oh duh, you can't!! I was actually mad at myself that I had waited so long to make this recipe, because it was soo easy, and soo good! Preheat oven to 350F. Butter a 8 inch square pan and put it on a baking sheet. Toss the flour, sugar, powdered sugar and salt into a food processor and pulse a few times to combine. Toss in the pieces of cold butter and pulse about 12 times, until the mixture looks like coarse meal. Pour the yolk over the ingredients and pulse until the dough forms clumps and curds-stop before the dough comes together in a ball.Turn the dough into the buttered pan and gently press it evenly across the bottom of the pan. Prick the dough with a fork and slide the sheet into the oven.Bake the crust for 15-20 minutes, or until it takes on just a little color around the edges. Transfer the pan to a rack and cool to room temperature before filling. Have a parchment or silicone mat-lined baking sheet at the ready, as well as a long-handled wooden spoon and a medium heavy bottomed saucepan.Put the sugar and water in the saucepan and cook over medium-high heat, stirring, until the sugar dissolves. Keeping the heat fairly high, continue to cook the sugar, without stirring, until it just starts to color. Toss the peanuts and immediately start stirring. Keep stirring, to coat the peanuts with sugar. Within a few minutes, they will be covered with sugar and turn white—keep stirring until the sugar turns back into caramel. When the peanuts are coated with a nice deep amber caramel, remove the pan from the heat and turn the nuts out onto the baking sheet., using the wooden spoon to spread them out as best you can. Cool the nuts to room temperature.When they are cool enough to handle, separate the nuts or break them into small pieces. Divide the nuts in half. 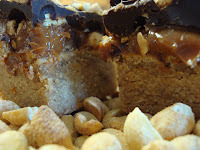 Keep half of the nuts whole or in biggish pieces for the filling, and finely chop the other half for the topping(I kept mine whole).Spread the dulce de leche over the shortbread base and sprinkle over the whole candied nuts. Melt the chocolate in a heatproof bowl set over a saucepan of barely simmering water. 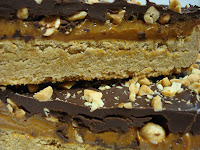 Remove chocolate from the heat and gently stir in the butter, stirring until it is fully blended into the chocolate.Pour the chocolate over the dulce de leche, smoothing it with a long metal icing spatula, then sprinkle over the rest of the peanuts. Slide the pan into the fridge to set the topping, about 20 minutes; if you’d like to serve the squares cold, keep them refrigerated for at least 3 hours before cutting.Cut into 16 bars. Wow! You're making me hungry. I like the peanut butter cookie idea for the base. These look fabulous! 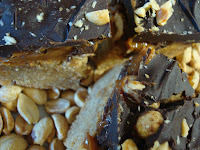 I made the Snickery Squares too! (But then I decided to attempt the madeleines too, even without the right pan.) I loved them - they're my favorite Dorie recipe so far. I've got to try these. It's time for a Dorie Rewind! PB base rocks! How clever, and they look divine. I'm eating an apple, but I'd rather be eating your wonderful squares, that's for sure! your snickery squares look great! i think i better try making these too! Oh this was definitely a goodie. Great pick! One of these days I'll get around to trying them! They look great! Peanut butter! Great idea! They look delicious. Good choice - those look fabulous! your snickery pb cookies look great! Mmmmmm. I love the pb crust idea! Those sound really good. Wow! Your take on this sounds delish!! I've been seeing a few of these around but your cookie based squares look incredible! yum yum and more yum!